All members at ProActive enjoy access to the cardio, strength training and free weight equipment, group exercise classes, three swimming pools and much more. Annual and month-to-month memberships are based on an individual basis with household discounts. 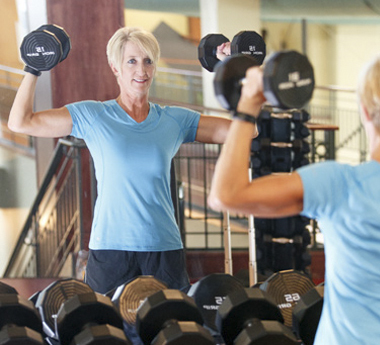 All adult memberships include individual consultations to help you along your wellness journey. 30-minute follow-up session with a personal trainer to ensure you are on the right path and answer additional questions. Discover your best self and continue to enjoy every moment life offers with a ProActive PLUS membership. ProActive PLUS is for adults 65 an older who want to remain healthy and active. Monday-Friday | 7 a.m. to 4 p.m.
Saturday and Sunday | 7 a.m. to 7 p.m.
Come by for a visit! Guest passes may be purchased for daily use. A guest punch card for 10 visits is available at a discounted rate. More information is available at the front desk. Click here to fill out the online guest waiver. Madonna Fit For Work, which provides real solutions for a healthier workforce, coordinates corporate client memberships for Madonna ProActive. Join other Lincoln businesses like Ameritas, Linpepco, HomeServices of Nebraska, Assurity, Lincoln Public Schools, State Farm and more by calling 402.413.4019. A longtime runner, Steve recently took up triathlons at 62. “After running outdoors all those years by myself it’s great to change to indoor training at this stage of my life. While I started at ProActive solo, I am now surrounded by a group of supporters, members and staff that are interested in my progress. That is important and I feel accountable to this social group now.” He alternates time on stationary bike with running on the indoor track, along with logging time in the pool. Steve completed the 2014 competition in just over six and a half hours, 38th of the over 500 military heavy competitors from around the world, and second in the 50+ age group to a 50-year-old that resides in the local area where the race is held. He's training to go under six hours this year and hopes to recapture his 2013 age group title. Al experienced a sudden heart attack in March, and he credits ProActive’s cardiac rehabilitation program with helping him to get his priorities in the right order. 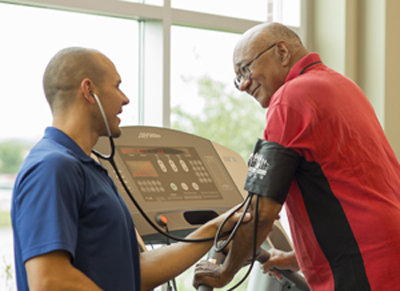 “I enjoy coming to cardiac rehabilitation, and seeing the improvements I make on a regular basis,” said Al. Under the close supervision of an exercise trainer, my cardiac rehab routine begins with a one mile quick walk and then I proceed to the elliptical for a two-mile trek. That is followed by a workout with free weights that included 10 exercises to build strength and help maintain muscle tone. I end my workouts with a one mile walk. When Al first joined ProActive he wanted to become more physically fit and to be able to work out all year long. He was able to increase strength, flexibility and endurance through workouts guided by a helpful, knowledgeable and professional personal trainer. Al views his heart attack as a setback, but one that he will overcome, as he continues his recovery at ProActive. Charlie Greene summed up his former athletic accomplishments in one phrase, “once upon a time.” The endearing 70-year-old ProActive member said, “Every individual has a moment that they can capture as their own, and mine was my Olympic accomplishment,” as he reflected on his previous athletic prowess. A University of Nebraska-Lincoln graduate with a gift for track and field, Charlie competed in the 1968 Olympics in Mexico City and won a gold medal as a member of a 4x100 meter relay team, and a bronze for the 100 meter. Married for 45 years to a wonderful woman he met on a blind date while at the Olympics in Mexico City, they have two daughters. There is some truth to the fact that good men have good women behind them, “said Charlie, who is thankful to have had the experts at Madonna alongside him this past year as he’s worked toward achieving his latest victory of recovery. Ann Tillery described her experiences through the continuum of care at Madonna. The integrated approach from Madonna Rehabilitation Hospital to Madonna Proactive Health and Fitness is what prompted my interest in joining. I felt fortunate to live near Madonna ProActive following my rehabilitation to be able to take advantage of ProActive’s thoughtful approach to wellness following illness. Madonna ProActive is a true community asset. I had lingering problems from a brain tumor and breast cancer back-to-back, then recurrent breast cancer. My brain felt like a BB in a frying pan; my thoughts and actions were all over the place. I could not concentrate nor stay focused. I was referred to Madonna Rehabilitation Hospital by UNMC for neuropsychology and speech therapy in 2011. Following these therapies, I utilized rehabilitative individualized pool therapy following my struggle with recurrent breast cancer/reconstruction to regain mobility and strength. Now I regularly take yoga at ProActive. Several neurologists suggested yoga to me as a way to calm anxiety, gain focus and build strength. For me, the practice is so much more and has become part of my wellness routine for the past three years. Yoga's healing and nurturing qualities are at the core of Madonna ProActive. It's a place where I feel rejuvenated and centered as I continue my lifetime wellness journey. I have utilized additional services at ProActive. When my grandson visits, we enjoy the pool area and water sprays. He is five years old and the children's pool is fantastic. He’s also enjoyed the childcare play center while I'm attending yoga. He can play or watch his favorite movie while I keep to my routine. Madonna has given me the strength to refocus my life and give back to the larger community as an advocate for Alzheimer's and other dementias. My personal experience post brain tumor and present rehabilitation has been a matter of mind, memories, clarity, strength and routine; powerful words which also give hope to others going through life-alternating challenges. Priscilla, a ProActive member since 2006, was diagnosed with multiple sclerosis years ago. She has used a variety of equipment and classes to improve her flexibility, strength, coordination and balance. She enjoys the many different offerings that allowed her to change her routine at any time. After a health assessment offered by her employer in June of 2012, Tricia was surprised to learn that her body fat percentage was 35.6%. She joined a fitness facility and had initial success, but was not happy with the atmosphere. She then joined ProActive in August of 2013. “ProActive has a more professional environment, better layout and equipment and a wide variety of members of all ages and fitness levels. When I wanted to take my fitness to the next level I started to work with Karen, a personal trainer. The upper and lower body workouts she outlined included a wide variety of exercises. Her body fat has since reduced to 18.9% and she has continued to progress.